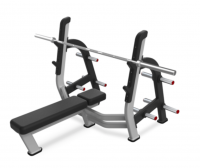 Molded urethane bar holders for quite, safe barbell placement, Dual bar holders for both short and tall users, open frame design for effective and safe spotting, Optional Olympic plate storage add on, features six pegs per side to accommodate all weight plate configurations, rubber feet for floor protection. 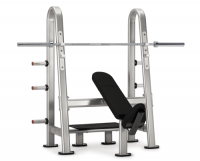 Diverging dip bars for various grip width options, wear guards on step up legs to protect finish, rubber feet for floor protection, elbow and back pad for abdominal training. Integrated grip and wheels for transport, wear guards on the crossbar leg to protect finish, rubber feet for floor protection. Split-angle Thigh Pads-Design of the thigh pads helps to ensure proper positioning and comfortable support. Height Adjustment-Thigh pads adjust in height to fit a wide variety of users. 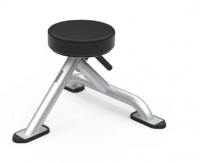 Multiple Seat Positions-Backrest tilts from -5 to 80 degrees and seat tilts to a 30-degree incline for a comfortable fit when performing free weight exercises. 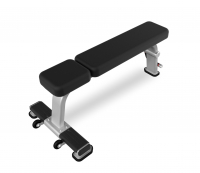 Easy Portability-Users can simply lift the bench with the handle and roll to desired area. 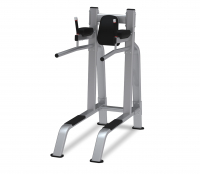 Curved Handles-Handles are curved to allow multiple grips for various chin-up exercises. Padded Armrests-Angled to ensure proper form, armrests are padded for comfort. Foot Platforms-Grip texture helps to ensure stable foot positioning.